is an excellent source of energy. What I like about the pasta fazool recipe is that you can make a big variety of the same kind of dish. You can make a vegetarian version of pasta fazool soup. You can make it in the traditional way or you can use a slow cooker. Moreover, the recipe we will make today has only three ingredients which you can grab easily. In other Pasta fazool recipes, you can add additional vegetables (carrots and celery), sausages, ham or bacon to make this soup even richer. There are many versions of this delicious pasta fagioli soup recipe, but I have decided to share the authentic Venetian basic one for a start. Once you master the basic one you will easily make all other versions. I would like to say that even if you have never cooked pasta fazool, this recipe is so simple that even beginner can do it with a success. and some extra virgin olive oil. That’s it. However, the main ingredient for this pasta fagioli recipe is your love and time you will dedicate to prepare this amazing meal. Check, save or print my recipe below. 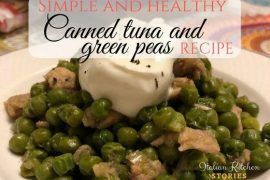 Italians usually start preparing this traditional recipe with the dry beans, but if you feel like you can’t dedicate the time needed, you can also use the canned beans. When using the dry beans (fagioli) they need to be soaked in water overnight with a tiny bit of bicarbonate. They will get nice and plump and will be ready to cook. I have soaked my beans for 2 days and have changed the water twice. To make your soup thicker you will need to blend about 1/3 of your beans (I squash them with a fork) and return them back into the mix. Thickness is a personal preference. For example, my Marco says he likes his spoon to stay upright of how thick soup he likes it to be. LOL I prefer it soupy and creamy. If you notice that once you have added pasta your soup has become very think and you don’t like it, feel free to add water to dilute it a bit. Remember to taste the salt and pepper afterward and add if necessary. The traditional pasta fagioli recipe calls for long kind of pasta such as tagliatelle. However, I have noticed that if you are planning to reheat the leftovers or freeze them, a much better option is the small shaped pasta. I would like to recommend small shaped pasta such as Ditalini from Barilla .This kind of pasta will not break in pieces and get mushy once defrosted or reheated. I have used different kinds of small shaped pasta (Ditaliani, Orecchiette, Mini Wheels etc), so you can do your own test and trials. 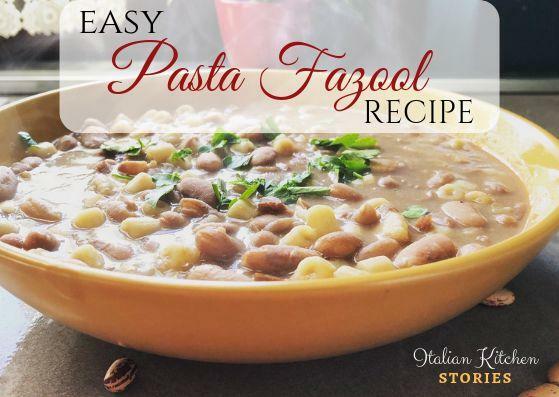 7 Questions you have asked about Pasta fazool recipe! 1. How to pronounce pasta fazool? The pasta is always pasta. That’s simple. Now let’s try to say fazool like an American Italian. Fa – zoo – l. It’s simple Fa like Fanta – Zoo like the animal’s zoo and finishes with a nice letter L.
2. How is pasta fagioli pronounced? Pronunciation of pasta fagioli like Italians do is simple if you do following: Say pasta then Fa (like Fanta) – Gio (like a name Jo, the letter i in Gio is silent and not pronounced) – Li (Like a flower Lily). Now you try Fa-Gio-Li. Say it once again Pasta Fagioli! There you go now you talk like an Italian. 3. Why is it called pasta Fazool? What does pasta fagioli mean? This traditional dish is called Pasta fazool meaning pasta and beans. What this dish is actually is very thick beans soup to which you add pasta at the end of cooking time. 4. Where is pasta fagioli from? Where did pasta fazool originate? Pasta fagioli is a traditional Italian dish. Every region has its version. This is old fashioned, but still very popular meal all over Italy today. Usually made during the cooler period of the year, but I have eaten it also in summer. 5. What is the difference between minestrone and pasta e fagioli? Minestrone is the thick soup that usually has 10 or more different kind of vegetables while pasta e fagioli is made with beans as the main vegetable. Wanna make a super delicious Traditional Italian Minestrone soup made from scratch in only 30 min? Check my recipe HERE. 6. So in that way fagioli have transformed into fazool? When new Italian generations were born in America, the original Italian words have changed with time. Many immigrants from Naples (Napoli – southern Italy) have brought with them their local dialect. In Naples, beans are called fasule. With time fasule had become fazool among the new generations of immigrants. However in Italy beans are still called fagioli. 7. How to make pasta fagioli in the slow cooker? Slow cookers are perfect when it comes to pasta fagioli soup as they will cook it slowly and all flavors will blend together and create a flavorful mix. I will still recommend soaking your beans before cooking, but you can reverse a procedure a bit. Saute’ the onions and bacon together until they get nice and shiny then add them to slow cooker together with beans and cover it all with water. Cook until beans are ready and then you can mush 1/3 of your beans and place them back to the soup as that will give the soup extra thickness. Add your preferred pasta shape and cook for an additional 5 minutes and then turn off. The pasta will finish cooking itself slowly with the heat of the slow cooker. This Pasta Fazool is an authentic recipe from Venice, Italy. You will fall in love with its simplicity and delightful taste from the first spoon. Place the dried beans in the cold water and leave them overnight to get soaked. Add Bicarbonate to the beans. 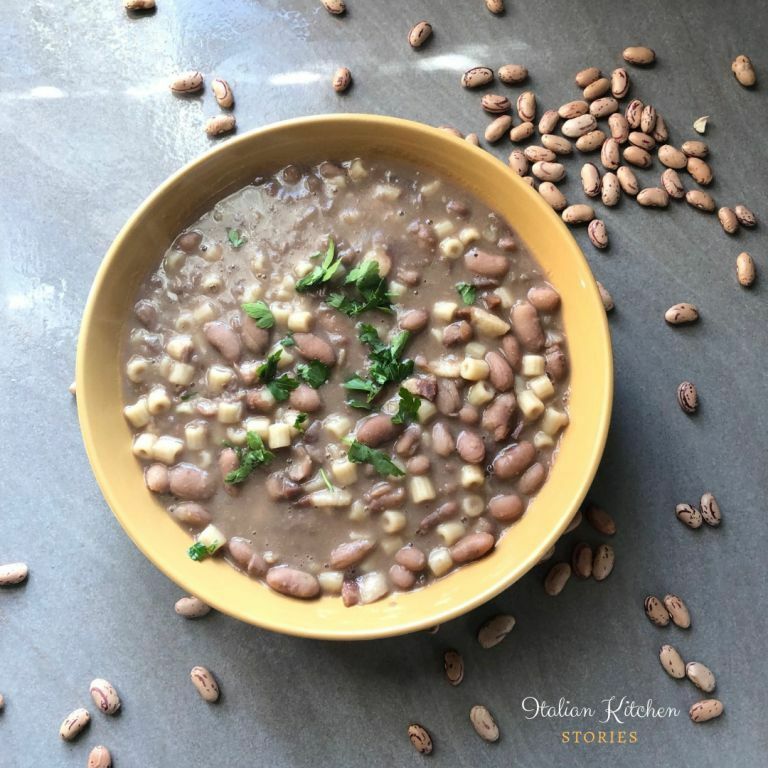 Next day you will drain the beans and place them in the pot you will cook them in and cover with cold water. Cook the beans over medium heat for 30 min or until you have noticed that they have become soft. Remove with the spoon all foam that will float on the surface. Take 1/3 of the beans our from the pot and mash them to get nice creamy texture. I have used plate and a fork but you can also use hand blender to do it faster. Put back the squashed beans in the pot and stir. Take a frying pan and add chopped onion and bacon and saute the until they both get nice color. Make sure that they don't burn. Once ready add them to your fazool soup and stir. Add salt and pepper to taste, stir and now add uncooked pasta. Cook for additional 5 minutes and then turn off the stove. Pasta will continue to cook with the heat of the soup. Serve this delicious Pasta Fazool soup with warm bread and a glass of Merlot. Easy Pasta Fazool recipehow to make Pasta FagioliHow to make pasta fagioli in the slow cookerhow to pronounce pasta fazoolItalian pasta recipePasta fagioli ingredientsPasta fagioli nutritionPasta fagioli recipePasta fagioli soupWhat is the difference between minestrone and pasta fagioli?Where is pasta fagioli from?Why is it called pasta fazool?